Prestege has been playing in the local circuit for over 14 years, playing at various venues here in Bermuda from local pubs to practically every Hotel lounges. Our appeal has always been energy and versatility, which is reflected in our extensive song list. We also have the unique ability to adapt to any audience and at any function, ensuring that we cater to everyone’s musical interest and preferences. Prestege has performed at many engagements, Conventions, Weddings and have opened for many prominent artists such as Peabo Bryson, Lou Rawls, Manhattans, Drifters, Faith Evans, Byron Lee and the Dragonairres and Keith Sweat. We have the ability to play fun, up-tempo and lively music which ranges from Soca, R&B, 60’s, 70’s and 80’s and Top 40 favorites as well as the classic ballads and 50’s tunes. Prestege has represented Bermuda overseas with the Department of Tourism in Washington, New York, Ireland and Boston. We also accompanied the Tourism Dept. on their Tourism Road Show in 2006 that took place in Boston, New York and Philadelphia. We have been nominated twice for “Best Performing Artist” at the Annual V.I.P. Excellence Awards (Preston Swan in 2001 and Ed Christopher in 2004). Prestege consists of the Duo combination of Preston Swan, (founder) and Ed Christopher. (Also the Hamilton Town Crier). 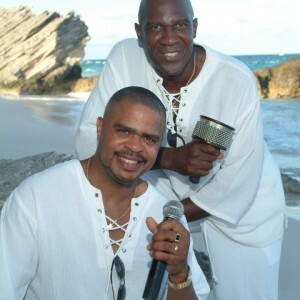 We have released our first CD entitled “ Bermuda Twist” which includes some original tunes as well as old time favorites such as “Bermuda is Another world” written by the late Hubert Smith and “Can’t get enough of your love” by the late Barry White to name just a few. Prestege is the only band known locally who do not take breaks. Even if that means playing for 4 or 5 hours! We enjoy music immensely and we have cleverly mastered the art of being not just good musicians but also Great Entertainers. We expect to be around for many more years displaying our musical talents and our unique style of interacting musically with their audiences.